Keep your cosmetic brushes neatly organised with this Glitter and Glam Cosmetic Supply Set from Make It Real. 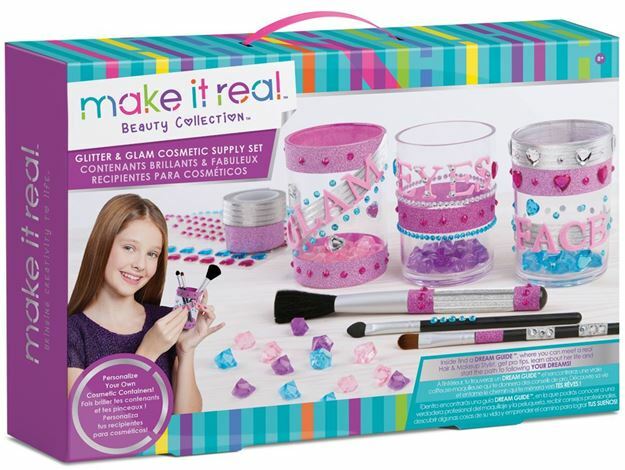 With this hands-on set, young creators can bedazzle their own acrylic containers with glitter and gems galore. Includes: 3 acrylic containers, 2 rolls of glittering decorative tape, plastic gems, eye shadow brush, blush brush, powder brush, alphabet letters stickers, rhinestones sticker sheet, instructions and a dream guide. Age 8+ years. Part of the Beauty Collection. Distributed in New Zealand by Holdson.